Good morning! Hey, I got my gestational diabetes result, and I passed! Hooray for that, and hooray for holiday carbs. I have a quick and easy card for you today using the Festive Farmhouse Suite. My card base is Mossy Meadow, 5-1/2″ x 8-1/2″, scored at 4-1/4″. I added a piece of Festive Farmhouse designer series paper, 4″ x 3-1/2″, then glued a second piece of paper (1-3/4″ x 4-1/4″) from the same paper pack on top of that. The twine is Mossy Meadow twine from the Festive Farmhouse Cotton Twine (expected to sell out soon). 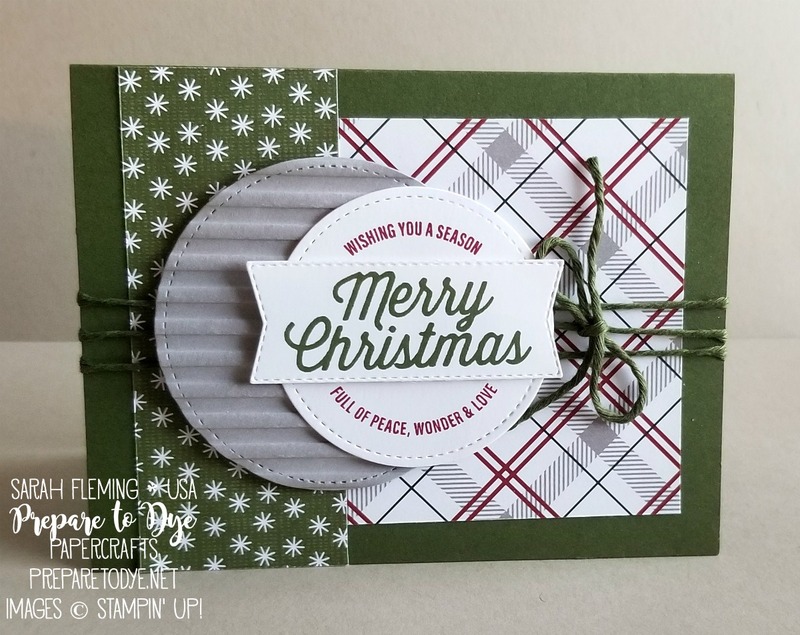 I cut out a piece of Gray Granite cardstock with a Stitched Shapes framelit (the largest circle), then embossed it with the Corrugated dynamic embossing folder and added that to the card with Dimensionals. I stamped the sentiment in both Cherry Cobbler and Mossy Meadow (this is one stamp, I just stamped it once in each color). I cut out the Cherry Cobbler one with the 2nd largest Stitched Shapes circle and added that to the card with Dimensionals (the ones hanging off the Gray Granite circle are double stacked). I cut out the Mossy Meadow Merry Christmas with a stitched banner from the Farmhouse Framelits (expected to sell out soon) and glued that to the card. Thanks for stopping by today! Everything I used on my card can be found in my online Stampin’ Up! store (see full supply list at the bottom of this post). 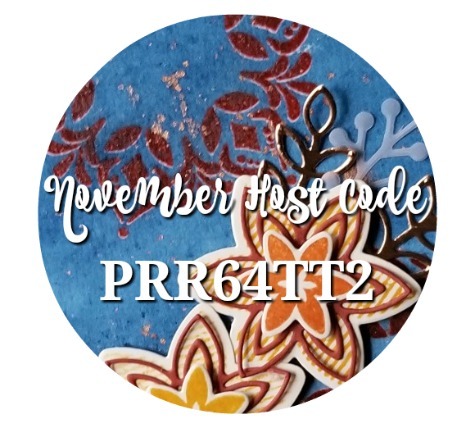 Make sure to use the November Host Code (below) if your order is below $150, and I’ll send you extra goodies! If your order is over $150, don’t use the Host Code — make sure to claim your Stampin’ Rewards when you check out, and you’ll still get my free gift!